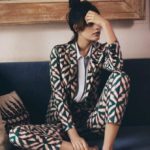 You only have to scroll through your Instagram or take a look at any magazine at the moment whether online or print media to notice that metallic is a trend that is everywhere; closely followed pleats. In the latter, the most flattering is the midi length pleated skirt and in the former metallic trend more is more – wear as much metallic as you possibly can – it’s so fun. I receive so many comments on this silver skirt, both from men and women. From men, the comments are usually ‘manrepeller-esque” whereby jokes about this gorgeous skirt resembling Bacofoil (other brands of tin foil are available) and did I make it myself – compared to women who “ooh and ahh” over it and ask if they can “feel the material” Why yes you can! It’s quite a stiff fabric, non-iron and keeps the pleats really well. Designed to sit high on the waist it’s really flattering. Below I have it teamed with my favourite white tee and white Converse but as it gets colder, it’ll go well over a bodysuit, a jumper, anything really, and I’ll wear it with boots. It’s so versatile and is one of my favourite off-duty pieces I’m looking forward to changing the style of it over A/W and I’m sure it will be back on the blog so look out for it. I have it teamed with my favourite white tee with all-white Converse but as it gets colder, it’ll go well over a turtle-neck bodysuit and tights, a gorgeous on-trend lattice-tie jumper I’ve got my eye on, an over-sized embroidered shirt, anything really. 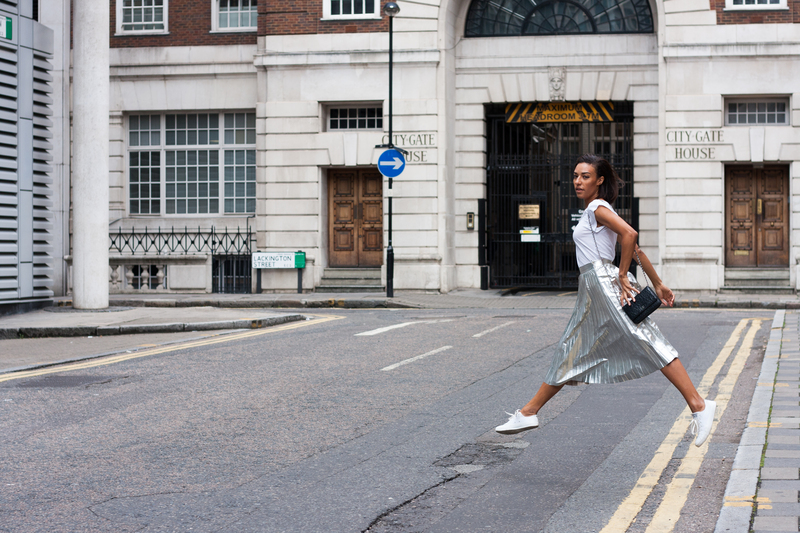 This silver skirt is so versatile and is one of my favourite off-duty pieces this season. I’m looking forward to changing the style of it over A/W and it will definitely be back on the blog so look out for it. This one is sold out at Zara, but there are a few around as this is such a big trend at the moment. Below are some examples of silver skirts and I have provided examples from the high-street, designer and luxury brands so hopefully you can shop for something similar regardless of budget and taste. I love this trend, let me know what you think. 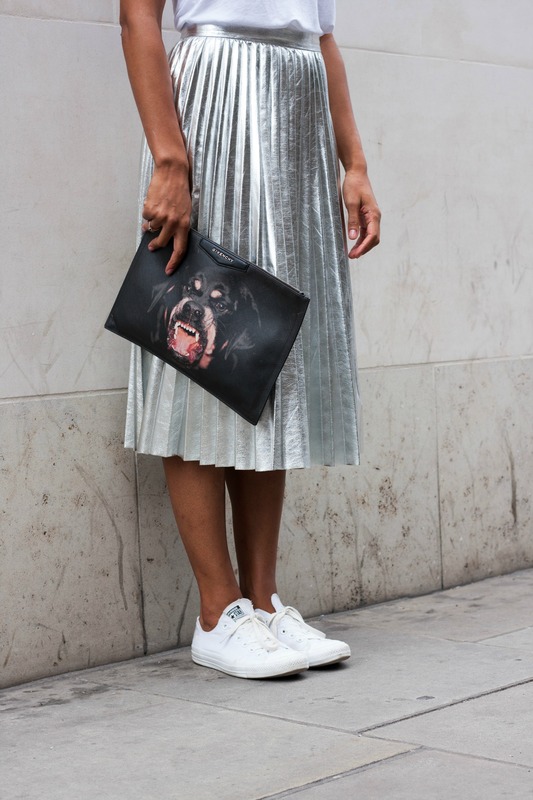 Do you have a silver skirt already? Comment below and leave a link to your blog or Instagram so we can see how you styled it!